I have a confession to make! As a busy community OT I often wondered whether theoretical models were really that relevant to my everyday practice. However, since starting my PhD journey I’ve had the good fortune of going back to the literature and exploring the rich theoretical base we have as a profession and I’ve come to the realisation that yes, theories are relevant to our everyday practice. For me, theoretical models give us the language to explain and explore what we do; it’s just a case of finding a theoretical model that helps you to do this. So for Occhat I am exploring two theoretical models that help me best explain and explore what I do as an OT, and now, as an OT researcher. The first model is PEO (Person, Environment and Occupation), developed by Law and the second is PEOP (Person, Environment Occupational Performance), developed by Baum. These models are based on the science of “ecology” and therefore they consider how the environment shapes our behaviour and how our behaviour shapes the environment. Or put another way, how the environment shapes the things we need and want to do and how we adapt our environment to do the things we need and want to do. In terms of explaining the models, I think they explain themselves and I have provided a couple of images of the models. The first model is the PEO and basically describes occupational performance as the transaction (complex interaction) between the person, occupation and environment. 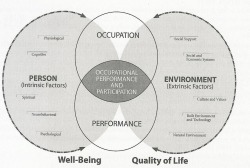 The model suggests that successful occupational performance occurs when there is a good fit or interaction between the person, environment and occupation. However, if someone is having difficulties performing an occupation, the OT can assess/analyse/consider the PEO elements to identify where the issues may lie and to then provide the appropriate intervention. The other element I like about the PEO model is it shows how the transaction between the PEO changes over time. The PEOP model is similar to the PEO model but it provides a bit more detail in terms of what we should be considering when analysing the person, environment and occupation. It also illustrates the transaction that occurs during occupational performance in a slightly different way. In what ways do you think these models help you explain what you do as an OT? What are the challenges of analysing the transaction between the person, environment, occupation? What ways do the social and economic systems in which you work influence what interventions you provide? If you want to do a bit more reading around the subject I’ve included some references and a couple of Prezzi presentation I found on the PEO and PEOP model. Law, M. (1991). “The environment: a focus for occupational therapy.” Canadian Journal of Occupational Therapy 58(4). Letts, L., et al. (1994). “Person-Environment Assessments in Occupational Therapy.” Canadian Journal of Occupational Therapy 48(7). Law, M. (1996). “The Person-Environment-Occupation Model: A Transactive Approach to Occupational Performance.” Canadian Journal of Occupational Therapy 63(1): 9-23. Strong, S., et al. (1999). “Application of the Person-Enviornment-Occupation Model: A practical tool.” Canadian Journal of Occupational Therapy 66(3). Christiansen, C., et al. (2005). Occupational therapy: Performance, participation, and well-being, Slack Thorofare, NJ. Letts, L., et al. (2003). Using environments to enable occupational performance, Slack. Cutchin, M. P. (2013). Transactional perspectives on occupation, Springer. Thanks Rachel – I’m looking forward to it. How is the transaction different between the two models? And what specific transaction are you referring to?